The new ESCON 36/2 DC digital servo controllers available from Maxon Motor Australia are designed to pack more power, functionality, convenience and protection in a small package. The first product in the new servo controller range by Maxon Motor, the ESCON 36/2 DC displays the user-friendly characteristics of drive technology. 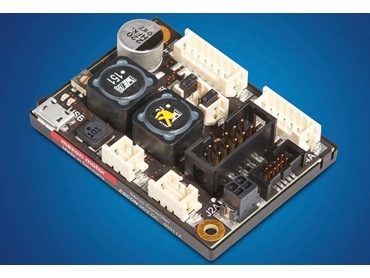 The extremely compact, powerful 4-quadrant PWM servo controllers offer efficient control of brushed permanent-magnet activated DC motors up to 72 W.
The ESCON 36/2 DC ultra-compact servo controllers have excellent control properties and a very fast digital current controller with an enormous bandwidth for optimal motor current/torque control. The drift-free yet extremely dynamic speed behaviour enables a speed range of 1 to 150,000 rpm. The new ESCON servo controllers have been designed specifically for easy start-up and user-friendly operation. When connected to a PC via a USB port, the servo controllers can easily and efficiently be configured with the ESCON Studio graphical user interface. The user has access to various functions and is assisted by user-friendly software wizards as well as a well-designed automatic procedure for fine-tuning the controller during start-up and configuration of the inputs and outputs, monitoring, data recording and diagnostics. ESCON servo controllers are ideal for drive applications, automation technology, small machine manufacturing and equipment engineering, and in mechatronics.